Thanks. I collect these things. It's rather a pole than a tree in my eyes. At least you don't have to smash hundreds of T-34 until the bitter end. Yes, that does seem rather strange, doesn't it? If you don't do absolutely great in Russia, your penalty/reward is a trip to sunny Italy! If you do well there, we'll transfer you back to France. At least you don't have to go back to Russia (unless you are defeated at some point, of course). EDIT: Actually, the more I think about it, the more it seems this might be in error. That is, knowing that there is an additional scenario to play in this DLC, one would be incentivized to NOT fulfill all secondary objectives in Vyazma or Moscow so as to play it? And then, what, a minor victory in Anzio means the end of the campaign? That does not make sense. 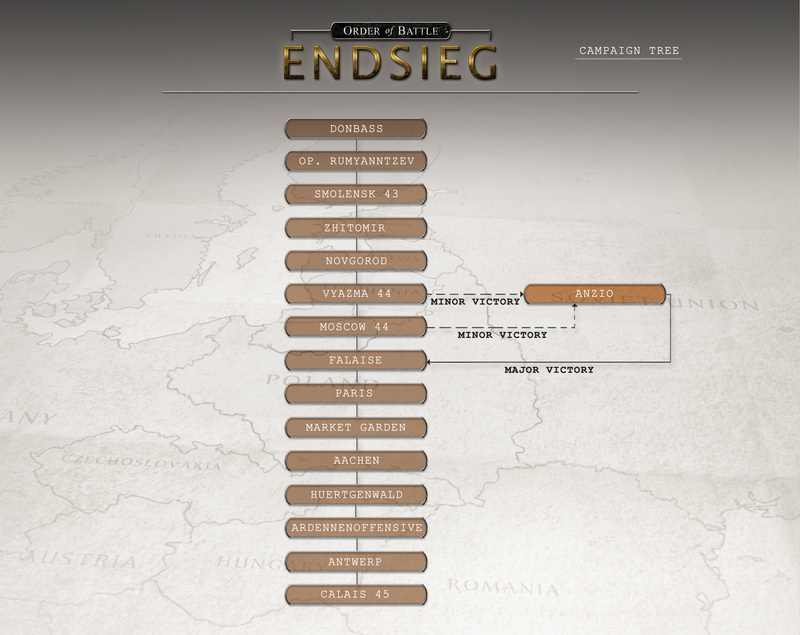 Of course, we need to wait until it's released to see how Endsieg will actually play out and whether this campaign branch actually does make sense. EDIT 2: Heh, I'm overthinking this as I do with everything else. But, if a major victory in Vyazma leads directly to Moscow whereas a minor victory goes to Anzio, then a major victory there goes to Falaise, does that mean one never plays Moscow? Vyazma minor > Anzio > Falaise, no Moscow, no "Win in Russia". Well, thank goodness for #gimmeall! Which will still work with Endsieg, I hope. This is gonna be a good DLC for sure. I like how Aachen and Huertgenwald are included. Most games always skip over those and go straight to the Ardennes but those are two very important battles and the participants deserve credit. I wish you could add in the Lorraine counteroffensive and the defense of Metz against Patton. I've never seen Lorraine in a game and only seen Metz once in a game (Battle Academy). Just staggered in here and learned of this exciting news! This is a MUCH appreciated addition to OOB! You get to Anzio via Vyazma, not Moscow (Moscow would be too late, date-wise). Vyazma minor victory is what brings you to Anzio. Edit: there seems to be a mistake in the pic posted in the OP, the broken line linking Moscow and Anzio should not be there. You do not go from Vyazma to Anzio. It's from Novgorod, minor victory. Novgorod is Jan 44, Anzio Feb 44, and Vyazma and Moscow are later. And Moscow is a no-brainer; no matter what you do, your next stop is Falaise! So to summarize, at Novgorod (not Vyazma) there begins this detour to Anzio which bypasses Vyazma and Moscow unless you achieve a Major Victory at Novgorod. Even then, only a Major Victory at Vyazma will allow you to play Moscow, otherwise you go to Falaise. Moscow is like a free pass; win or lose, you're going to Falaise. Whoever made the graphic above should correct it.